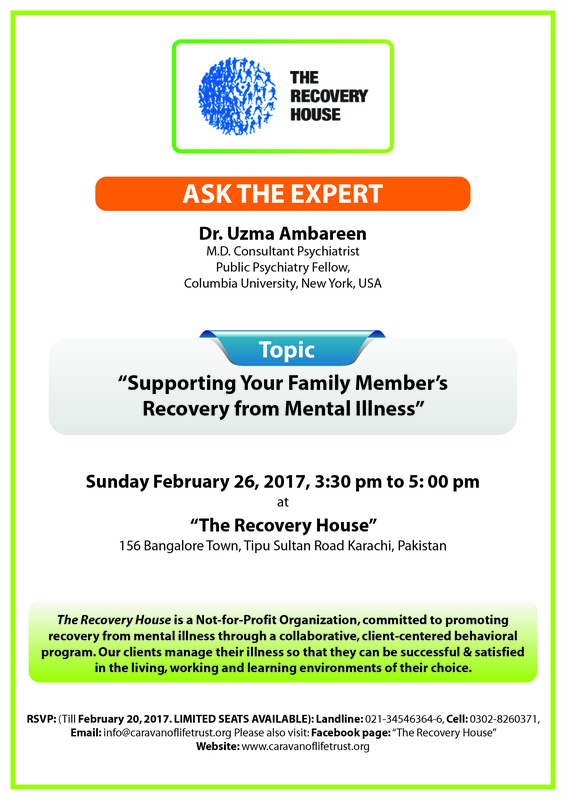 The Recovery House offers an extensive number of services to its clients. These services can further be divided into therapy techniques and units. Therapy techniques entail approaches that aim to improve mental health or, where applicable, alleviate mental illness entirely and then maintain the state of recovery and wellbeing. On the other hand, units are mini-therapy sessions that uphold the ideals of psychiatric rehabilitation and aim to equip clients with some new skill, to reskill clients to a restore clients to a former level of functioning, to impart training, or to facilitate the preparation of someone to resume normal life after an illness. Testing services are also available as per need, and include assessments of personality, intelligence and symptoms, as well as speech, language and cognition evaluations. Below is a list of the therapy techniques being offered currently at The Recovery House to the clients who require them. Since recovery plans are exclusive to each individual client, therapy techniques may vary between clients. Moreover, clients are at liberty to pick and choose the units they would like to be a part of as multiple sessions are in-progress at any given time. All units are supervised by their respective facilitators at all times. Social skills – Widespread deficits in social skills or social functioning often accompany serious mental illnesses. This unit aims to arm our clients with the interpersonal skills necessary to gain and then maintain an independent level of functioning. •	Conflict resolution and problem-solving – allows the clients to learn ways of tackling problems in their everyday lives, as well as encouraging them to think out of the box and figure out ways around problems they may face in hypothetical situations. •	Cooking and baking – a group unit which is designed to improve Independent Living Skills and integrate elements of independent living such as budgeting, shopping, cleaning, health and safety and health and nutrition. It also aims to empower clients, encourage decision making, and to attain a first-hand take on cooking and baking. •	Creative Writing – aimed at increasing verbal and written expression of clients, as they experience poverty of thoughts and communication. •	Daily living skills – arms clients with the necessary skills to be able to live independently. These include self-care and hygiene, control over appetite, organizing their spaces efficiently and effectively, and much more. •	Eco-Therapy – this gardening-based activity conducted by Zahra Ali and Yasir Husain from Crops in Pots aims to make clients more observant of nature though meditative sessions in which they are made to relax and listen to sounds, feel textures and concentrate on smells in a garden. Gradually, their mind-body coordination will be improved by engaging them in different garden jobs like weeding, re-potting, pruning, sowing seeds, watering, etc. •	Exercise – this unit mainly serves the purpose of keeping our clients fit. •	Expressive arts – provides clients with mixed media to express themselves with, in any way they prefer, be it through painting, sculpting, crafts, or origami. •	Facilitation of re-entry into society – a part of our outreach services, this unit helps people get adjusting into their jobs, facilitates their getting jobs, and assists them with any preparations they may require for their jobs. •	Gardening – encourages clients to write about any and every thing that comes to their mind, whether about their lives, likes or dislikes, for the newsletter, for themselves, for their family members or for fellow clients. •	IT – promotes communication with people over the internet, learning of Microsoft Office, and training them for skills required during their jobs. •	Money management – this unit teaches clients about budgeting, savings, bargaining, and other ways to manage their money and to ensure it does not go to waste. 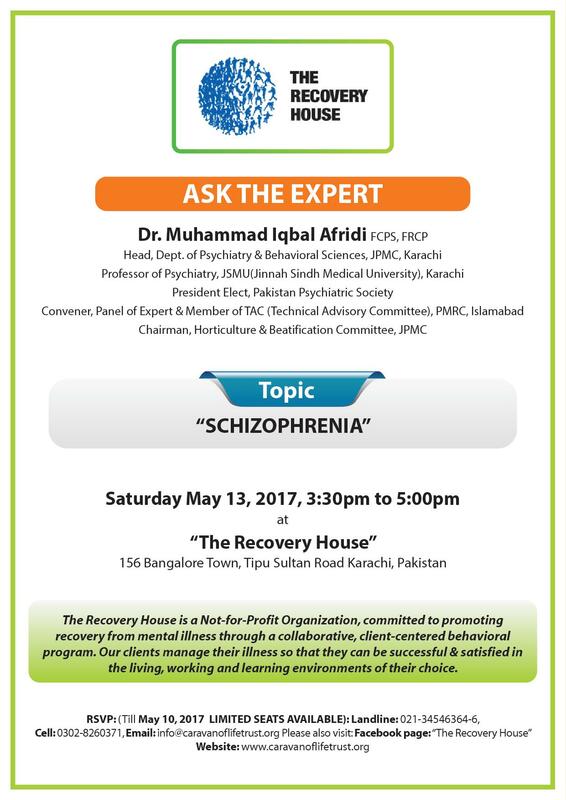 •	Newsletter – a session on writing and formatting for a potential newsletter to be circulated on the premises of The Recovery House. •	Peer support – a phenomenal and integral part to recovery and rehabilitation is peer support. This unit is conducted by the clients themselves, and in it, clients help each other learn different skills and educate each other about the symptoms that they had also experienced, how they have managed to cope with them, and the progress they’ve made since they embarked upon the journey of recovery. •	Problem solving – involves discovering, analyzing and solving problems of all sorts. The ultimate goal of problem-solving is to overcome obstacles and find a solution that best resolves the issue. The group unit experience expedite client’s problem solving skill/ability and peer learning. •	Process group – a group session aimed at identifying and processing one’s emotions and thoughts to encourage appropriate self-disclosure and develop empathy. The main purpose of the Process Group is to provide a forum to clients where they can explore the day-to-day difficulties and learn healthy ways to manage difficult emotions. Issues such as anger, stress, negative thinking, lack of patience, dissatisfaction with life, people or surroundings are discussed among other issues. •	Sound therapy – this unit, conducted by a sound therapist, aims to build self-expression, improve recollection and memory, enhance listening skills and sensorimotor coordination, encourage synchronization and coordination with group, as well as to skill clients with the ability to play instruments of their choice, and be able to use that instrument as a medium of expression. •	Visual Arts – aims to encourage clients to see positive sides to everything, teach them to capture a moment perfectly. This unit also helps them to develop observation power along with teaching them the basics of professional photography and photo ethics. •	Vocal therapy– aims to train the clients in eastern traditional vocal training, and to create a judgment-free zone for them to voice themselves and hit the right pitch, even if through nonsense syllables. •	Yoga – aims to decrease anxiety for the clients, as well as help them relax their bodies, encourage them to find inner peace, live in the present and let go of the past. This unit caters to each client’s needs and requirements individually, along with breaking through their rigidity and anxieties.